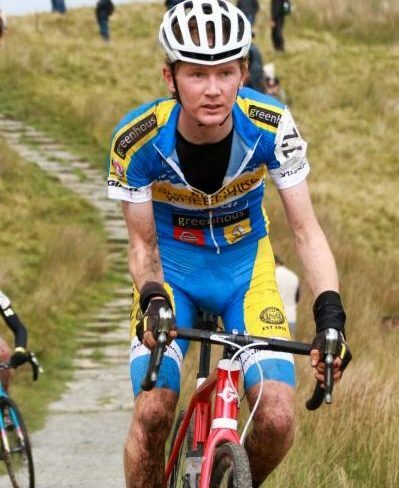 Billed as the Worlds Toughest Cyclo Cross the 3 Peaks in it’s current format is a 60km race that has 1542 metres of climbing and 4 Miles of carrying your bike! Starting in Helwith Bridge the 650 entry heads off a long the road in “neutralised” convoy before heading through a farm yard and over Simon Fell to the first of the peaks, Ingleborough. Around 10 Mids entered but only 3 intrepid members made the lottery entry system, Stephen Handley for the first attempt and on the back of son Ewan Grivell-Mellor’s first time entry, Dave Mellor made it in to stake a claim to the Father and Son category. Ewan had taken part in the Hope Technology Pre Peaks a 50 mile warm up event over Bank Holiday weekend and this is an event to be recommended whether you are training for the 3 Peaks or not. Riding round and finishing with eventual winner of the 3 Peaks Paul Oldham, Ewans pre peaks training looked to be going well. Stephen Handley missed some WMCCL events too get some big miles in over to the Welsh coast and back and Dave Mellor made do with short runs, walks over Pontesford Hill and ride outs to Pontesbury before a fast walk over the top and running down hill. All different preparation methods. The start lane at Helwith Bridge is very daunting and busy and you are asked to line up at markers according to your predicted finish time. Dad Dave had instructed Ewan to go deep on the first Peak and to be with the leaders as once the gap is there, despite the race being a long one, you never get back to the front if you are not in a group on the road link sections. Who would have thought the normally pushy Ewan GM would then line up in about 200th place which meant his race for the u23 title was over as the “neutralised” section was run off at well over 25mph. Stephen’s road miles were an advantage here but even he was surprised at the “neutralised” speed. Dave was just happy to keep out of the way and safely negotiate the panic as riders slammed on the brakes to get around the tight bends, especially at Horton in Ribblesdale. On the descent of Ingleborough, both Ewan and Stephen punctured, a hazard on this rocky descent, Dave using a slightly larger tyre survived without incident although at times the cantilever brakes proved only just up to the job and disc brakes would have been more appropriate. Both Ewan and Stephen were strong on the road link sections on the way to Whernside and Pen y Gent, picking up places but both punctured again on Pen y Gent. Ewan eventually finishing as 3rd under 23 and leading the team in to 40th place out of 70 plus teams and 5th in the Father and Son category. Entries will again be by lottery in 2018 but now we have the ball rolling with all three entries getting round, no mean feat, then hopefully Mid Shropshire Wheelers will get noticed on your entry form.